Located Downtown on Côte-des-Neiges Street with 1,455 sq. ft., this two level condo with 2-bed and 1-bath, with stunning views of the mountain, hardwood flooring, 10-foot ceilings and great building amenities including on-site gym and valet parking service. 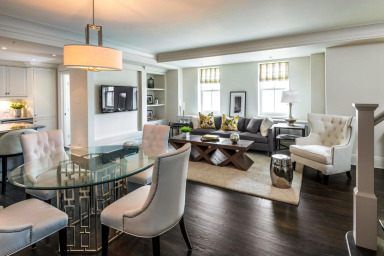 Elegance and sophistication awaits you at Penthouse Gleneagles in this fully-furnished, two-bedroom and one-bathroom luxury condo. With a classic and refined décor throughout, the large open-concept living space downstairs offers everything you need to relax and feel right at home. A sunny den area includes a flat-screen TV, the 4-person dining table is perfect for entertaining guests, and the beautifully renovated kitchen is fully-equipped with modern appliances, granite countertops and a kitchen island with stools. Upstairs, find two closed queen-size bedrooms, as well as a designer bathroom complete with freestanding soaker tub, smooth faux-marble tiling, and a double vanity. This unit also includes a first-floor powder room, office desk and a hidden stackable washer/dryer for your added convenience. Simplissimmo is Montreal living at its finest. Originally built in 1929, Gleneagles is one of the most historic and prestigious residential complexes in the city. Nestled in Montreal’s Mount Royal, Gleneagles offers an exceptional lifestyle in a truly remarkable environment. Residents have exclusive access to the luxurious shared lounge with a view as well as a state-of-the-art on-site gym. Other services include 24-hour concierge and valet service, heated indoor garage and free outdoor parking for visitors. With easy access to the downtown core as well as being surrounded by the majesty and nature of Mount Royal, this particular address offers the best of both worlds. In the immediate vicinity, take advantage of the many walking/cross-country ski trails and luscious parks located within the mountain, including the newly redesigned Beaver Lake, which offers numerous seasonal activities for all ages. For great shopping, cultural attractions and entertainment, head over the Golden Square Mile district only minutes away. Explore the Museum of Fine Arts on Sherbrooke Street, the endless name-brand stores and boutiques along St-Catherine Street, and what trip to Montreal would be complete without experiencing the lively Crescent Street for some of its infamous nightlife. You’ll love Downtown!